Reach conditioner protein, which in itself was a dream of the perfect product. Great flavors, three different sources of animal protein, good price and most importantly the highest world-class quality. Whey Creamy Cocktail is a combination of optimum proportions of complete whey and milk proteins and great taste. Each sweet and creamy shake provides essential for building and regenerating muscle proteins and amino acids. WHEY CREAMY COCKTAIL is a product through which a tasty and convenient way to supplement a protein deficit resulting from intensive exercise or a low calorie diet. WHEY CREAMY COCKTAIL is a nutritional supplement for athletes and people who are physically active, enabling the building of pure muscle mass and body contouring. Protein is the most important building block for the body, which includes all of its cells. Very often the daily diet does not provide the amounts of valuable proteins which our body needs or protein consumed by us is simply low quality. You want to build strong muscles, shape your body, or simply enrich your diet? The thought comes to you one solution - protein supplement. Great idea! It provides protein in concentrated form by allowing you to quickly and efficiently complete their deficiencies. Surely you have already tried many of these preparations! It tasted Those first few servings, but later began to have a real struggle to persevere and finish packing. You have quite rare sheikhs, which taste like stale infant formula? Who said that the protein can not be really tasty! Finish your protein nightmare! You train and you're on a diet, but that does not mean you have to deny yourself the pleasure. Reach for WHEY CREAMY COCKTAIL, and will not want to replace it with any other product! WHEY CREAMY COCKTAIL is no ordinary protein supplement. It's a great, thick and fueled the sheikh, who make that daily supplementation of protein will become for you a real pleasure. This specially designed product that provides nutritious, rich in all essential amino acids of proteins. His recipe is the result of many hours of sensory tests, which allowed achieve unprecedented taste and emphasizing its advantages creamy consistency. Adequate protein composition of the best raw materials, additives and aromas contained in WHEY CREAMY COCKTAIL will provide your taste buds an unforgettable experience and will help to keep long-term satisfaction of use. Its carefully selected flavors will satisfy even the most demanding palates. Try WHEY CREAMY COCKTAIL! Such supplements have never been drinking. 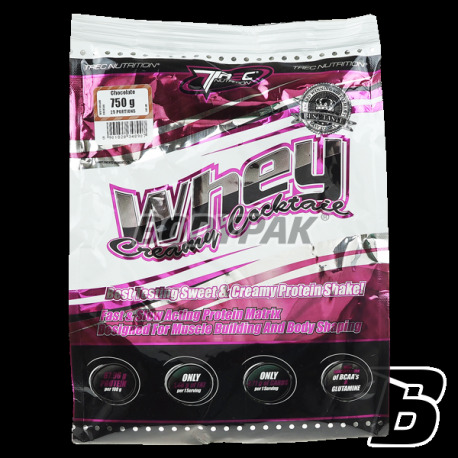 TREC WHEY CREAMY COCKTAIL contains an advanced premix protein (PROTEIN MATRIX), which provides an extremely valuable and necessary in your daily diet nutrients. 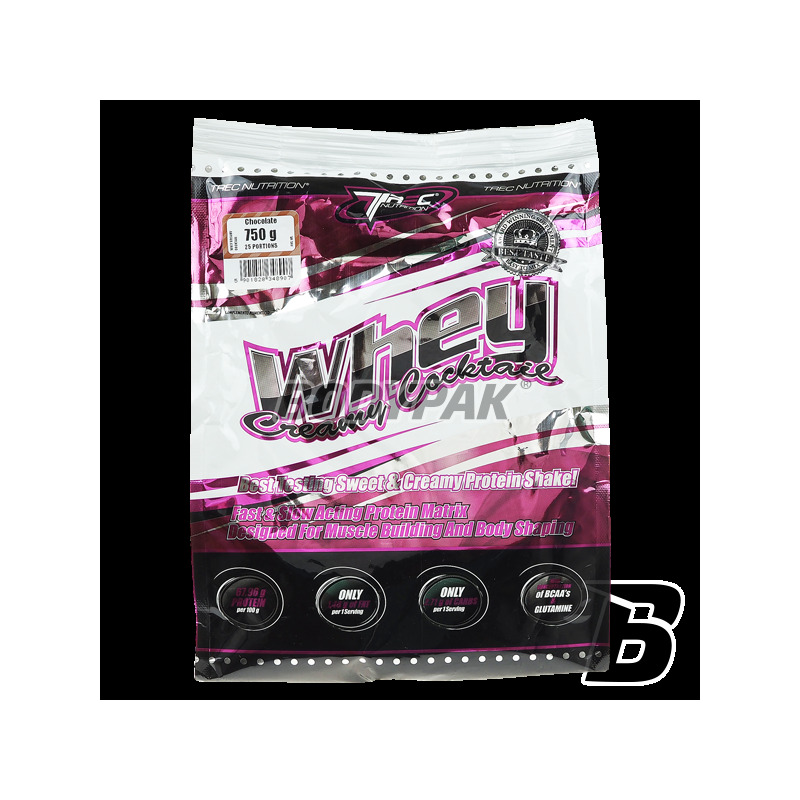 Fast acting whey protein (WPC) has been supplemented by an excellent protein with moderate absorption time: MPC and casein. This has provided a versatile product that can be used whenever you need additional servings of high quality protein. WHEY CREAMY COCKTAIL ideally suited as a complement to the sports breakfast, post-workout sheik, or a light dinner. The product contains valuable proteins which accelerate the metabolism help to reduce body fat. That's why this creamy and sweet Sheikh is a great idea for a delicious and full nutritional meal replacement, and low in calories dessert. Its taste will help you spice up even the most restrictive diet, and will further increase its efficiency and help to maintain the desired effect. WHEY CREAMY COCKTAIL is a universal protein supplement intended for daily supplementation. Its use is especially recommended for those who have an increased need for protein associated with intense physical activity. WHEY CREAMY COCKTAIL is also recommended as a low-calorie alternative to regular meals and sweets, allowing to maintain a restrictive weight loss diet. Additional ingredients: Cocoa - flavor enhancer and smell the taste of chocolate, strawberry-chocolate and cherry-chocolate; sodium carboxymethylcellulose, modified starch - thickening agents; citric acid, malic acid - acidity regulators for the strawberry flavor; fructose, sucralose, saccharin sodium, sodium cyclamate - sweeteners; cochineal red - color for the strawberry flavor; beta-carotene - color for the vanilla-cream flavor. The aromas are dependent on the version of the taste of the nutrient. Flavors are used depends on the flavor conditioners.